The Sonoma Diet is a mediterranean type diet from author and dietitian Connie Guttersen. The name “Sonoma” comes from a region in Northern California, USA, that has a prominent wine industry. UPDATE: The new edition – The New Sonoma Diet has revised over half the content of the original. Highly Recommended. The principles of the Sonoma Diet are based around the Mediterranean Food Pyramid. Enjoyment of food, gourmet cooking, and moderate portion sizes are the keys of this diet. The weight loss program has 3 stages (called waves). Wave 1 is a more restrictive phase lasting 10 days. The idea is to break ties and addictions with sugary and fatty foods – however this is not a severe induction phase. Wave 2 is the primary weight loss phase where each meal is created with appropriate portions. There is no calorie counting or special foods or supplements. Wave 3 is a lifelong eating pattern for weight management. The New Sonoma Diet comes with a wine guide to assist in selecting the appropriate wine to accompany the evening meal. The New Sonoma Diet Retails for $15.85. The online Sonoma Diet is free for the first 7 days and then $4 per week. The official website. In a very large bowl combine greens, meat, tomatoes, cucumber, and basil. Drizzle with Red Wine Vinaigrette. Toss to coat. Season to taste with kosher salt and pepper. Top with feta cheese and pine nuts. Serve immediately. Nutrition Facts per serving: 267 cal., 13 g total fat (3 g sat. fat), 80 mg cholesterol, 318 mg sodium, 6 g carbo., 2 g fiber, 30 g pro. Nutrition Facts per serving: 258 cal., 12 g total fat (2 g sat. fat), 70 mg cholesterol, 288 mg sodium, 11 g carbo., 3 g fiber, 26 g pro. Thaw fish, if frozen. Rinse fish; pat dry with paper towels. Cut fish into 4 serving-size pieces. Brush both sides of fish with oil and lemon juice; sprinkle with kosher salt and pepper. Sprinkle garlic and rosemary evenly onto fish; rub in with your fingers. Top fish with capers. If desired, garnish with fresh rosemary. Nutrition Facts per serving: 145 cal., 3 g total fat (1 g sat. fat), 51 mg cholesterol, 179 mg sodium, 1 g carbo., 0 g fiber, 27 g pro. Broiler method: Place fish on the greased unheated rack of a broiler pan. Broil 4 inches from the heat for 8 to 12 minutes or until fish flakes easily when tested with a fork, turning once halfway through broiling. For marinade, in a blender combine mint leaves, lemon juice, oil, soy sauce, chili powder, pepper, and garlic. Cover and blend until smooth. Place chicken in a self-sealing plastic bag set in a shallow dish. Pour marinade over chicken. Seal bag; turn to coat chicken. Marinate in refrigerator for 4 to 24 hours, turning bag occasionally. Drain chicken, discarding marinade. For a charcoal grill, place chicken on the rack of an uncovered grill directly over medium coals. Grill for 12 to 15 minutes or until no longer pink (170°F), turning once halfway through grilling. (For a gas grill, preheat grill. Reduce heat to medium. Place chicken on grill rack over heat. Cover and grill as above.) If desired, garnish with mint sprigs. Nutrition Facts per serving: 202 cal., 6 g total fat (1 g sat. fat), 82 mg cholesterol, 228 mg sodium, 2 g carbo., 0 g fiber, 34 g pro. In a covered large saucepan cook carrots in a small amount of boiling water for 5 minutes. Drain; rinse with cold water to cool quickly. Drain well. Place carrots in a medium bowl. Add Harissa Sauce and garlic; toss to combine. Cover and let stand at room temperature for 30 minutes to develop flavors; stir occasionally. Sprinkle servings with olives and feta. Serve with lemon wedges. Nutrition Facts per serving: 136 cal., 8 g total fat (2 g sat. fat), 8 mg cholesterol, 340 mg sodium, 18 g carbo., 6 g fiber, 3 g pro. In a large skillet heat oil over medium-high heat. Add shallots and garlic; stir-fry for 1 minute. Add peppers. Stir-fry for 1 minute more. Add shrimp; stir-fry for 2 to 3 minutes or until shrimp are opaque. Drizzle with lemon juice. Sprinkle with cilantro. Nutrition Facts per serving: 195 cal., 9 g total fat (1 g sat. fat), 172 mg cholesterol, 171 mg sodium, 5 g carbo., 0 g fiber, 24 g pro. *Note: Because hot chile peppers contain oils that can burn your skin and eyes, wear rubber or plastic gloves when working with them. If your bare hands do touch the chile peppers, wash your hands well with soap and water. The Sonoma Diet is a healthy and balanced diet from an author well-versed in the Mediterranean style of eating. Whilst growing popularity may cause some to see the diet as a fad, it remains an excellent diet none-the-less. Guttersen, C. (2005). 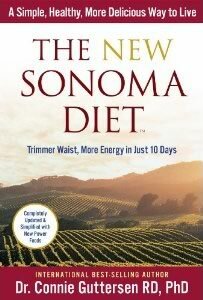 The Sonoma Diet: Trimmer Waist, Better Health in Just 10 Days!. Meredith Books. Wish your recipes were for 2 servings and I live alone. Have your book but 6-8 servings is too much for me. On January 2, 2009, “Health”, the online version “Health” magazine published “America’s Top 10 Healthiest Diets,” composed by a panel of experts. Number 9 is a Mediterranean-style diet, The Sonoma Diet, published in 2005 and written by Dr. Connie Guttersen. Dr. Guttersen attributes overweight to over-consumption of refined sugars and flours and other “fast-absorbing foods” that displace fruits and vegetables. Her remedy is to eat controlled portions of the fresh, minimally processed whole foods of the healthy Mediterranean diet. Portions are controlled by eating off 7 and 9-inch plates and from 2-cup bowls, covering percentages of the plate with protein foods, grains, fruits, and vegetables. Fatty food portions are also controlled. Allowable foods are numerous, including whole grain products, fruits, vegetables, chicken, lean beef, fish, poultry, pork, veal, low-fat dairy, legumes, eggs, nuts, and wine. Her “Wave 1” lasts 10 days and is designed to teach portion control and to overcome habitual over-consumption of concentrated sugar, refined flours, and other highly processed foods. Wave 2 includes more variety, adds fruit and wine (optional), fat-free yogurt, and more calories. Both waves include unlimited particular vegetables characterized by high fiber and low calorie-density. In Wave 3—the rest of your life—you eat more fruits and vegetables and continue to avoid fatty meats, fruit juices, potatoes, full-fat dairy, trans fats, saturated fats, sugary sweets, and refined grains. She’s fanatical about avoiding saturated fats. At first glance, it appears the author puts everyone on the same eating plan, whether a 325-pound ditch-digger or 150-pound desk jockey. However, she allows “bigger men” and very physically active women the option of more snack calories, about 400 daily. Dr. Guttersen never reveals how many calories are on the diet, nor how many should be. A review in Consumer Reports estimated that calories on Sonoma were 1,390 per day. That’s fine for most women, but inadequate for most men. The extra snacks for men, along with unlimited veggies, should get them up to a more reasonable intake. “Consumer Reports” calls Sonoma an “updated lower-carb diet.” Sonoma may have more protein than the traditional Mediterranean diet, but it is by no means low in carbohydrates. Dr. Guttersen recommends following her specific thrice-daily meal recipes for Waves 1 and 2, a total of 24 days. But you are free to come up with your own meals based on the approved-foods list and plate percentages. Her meals entail a significant amount of preparation, but the recipes look like they would be worth it. Since this is a review, I feel obligated to criticize something. So . . . 1. Dr. Guttersen never discusses reasonable goal weights. 2. She doesn’t understand that jogging and biking are aerobic exercises, not strength training. 3. She doesn’t discuss exercise much, although does recommend it and gives good basic advice. 4. She recommends breakfast cereals with at least 8 grams of fiber per serving. These are unpalatable and, fortunately, rare. [Three grams per serving is fine.] 5. Sonoma is not as customizable as I would prefer. 6. Cold-water fatty fish should have made it onto her list of Top Ten Power Foods. Dr. Guttersen provides an extensive scientific reference section, which is both admirable and helpful. Another feature I love is the pull-out section in the back of the book which summarizes the approved foods and depicts the plates and bowls with food percentages. Pin these to your refrigerator or take to the grocery store. An entire chapter is devoted to common problems of dieters, such as eating at restaurants. The Sonoma Diet is a masterful application of the Mediterranean diet to weight loss. I congratulate Dr. Guttersen. References: ConsumerReports.org in May, 2007, rated seven popular book-based diet plans.